Gift cards are a multi billion dollar industry and it's only growing! CardCash took a consumer survey and compiled the most up to date statistics so you can have a clear picture of what's really going on. While physical gift cards are growing at an annual rate of 6%, digital gift cards are growing at an annual rate of 200%. During a 2016 evaluation, it was found that 81% of top internet retailers offered digital gift cards. 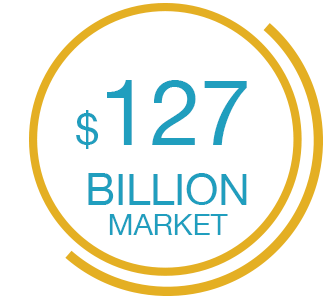 Digital gift cards are the fastest growing segment within the $127 billion gift card industry. E-gifting is expected to hit 10 billion by 2016 and $14 billion by 2017, comprising nearly 10 % of the gift card market. Fifty percent of respondents said they would prefer to have a digital gift card scanned from their phone than carry an email printout. Also, 53% said they would be interested in storing gift cards on their phones. 60% of gift cards that are sold on the CardCash website are digital e-gift cards. Since 2014, CardCash has increased the amount of gift cards that get sold as ecards. In the past 2 years, we accepted over 100 more e-gift card merchants! 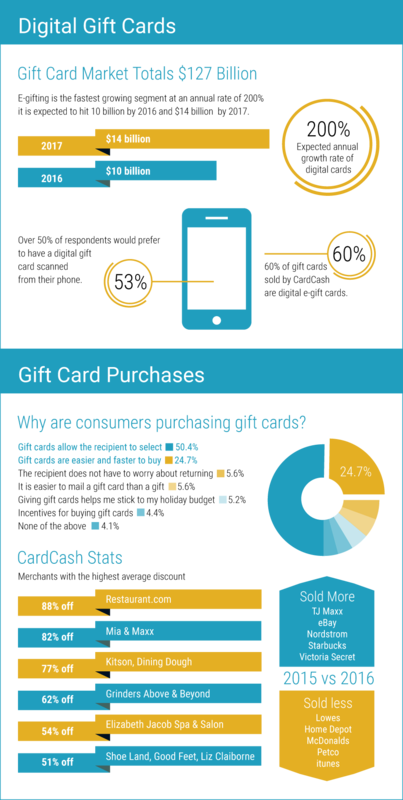 During the holiday season, digital gift cards are more frequently purchased (76% vs 66%) on CardCash.com than physical gift cards. An increase of 15%. 73% of consumers said that they will be purchasing a gift card this holiday season. On average most consumers purchase 2 gift cards during the holiday season, followed closely by 3 gift cards. Why are people buying gift cards? 50% of consumers like allowing the recipient to purchase their own gift. Almost 25% of consumers say that gift cards are easier to buy. The higher your income, the more likely you are to have purchased or received a digital gift card. Millennials are more than twice as likely to have purchased or received a digital gift card than someone above the age of 35. Where you live can make a big difference in whether you have purchased or received a digital gift card. Midwesterners are less likely to have purchased a digital gift card than their eastern and western counterparts. In 2015 and 2016, CardCash conducted a survey to see how many people received digital gift cards. We saw a marked 22% increase of people who had digital gift cards in 2016 than in 2015.